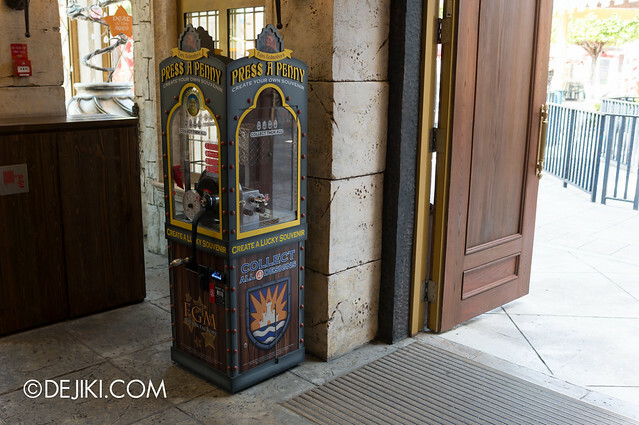 Press A Penny machines landed in Universal Studios Singapore in June 2012. For just S$2 a piece, these pressed coins are affordable souvenirs from the park. I have received a lot of requests for a post about these pressed coins and finally got down to producing this entry – right after submitting some term papers. 1. Select a coin design. 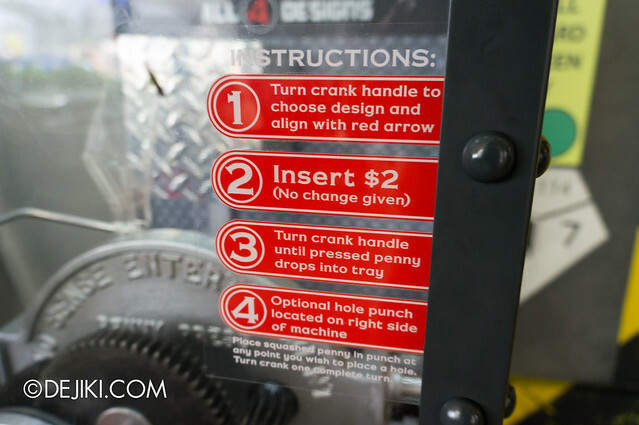 Turn the crank until the red arrow is pointing at the design you want. 2. Insert money into the machine (Coins and $2 notes accepted). There is no display of money inserted into the machine, so please do count your coins before placing them into the machine. 3. 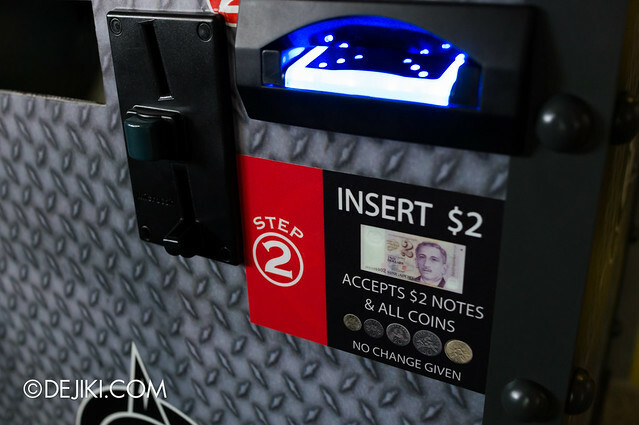 Once you have inserted $2 (or more), you will see a copper coin dropping into a little chute inside the machine. Turn the crank until the copper coin drops again. Keep turning the crank until the coin falls into the drawer. 4. Collect your coin! You may also cut a hole (with the machine’s hole punch) if you wish. 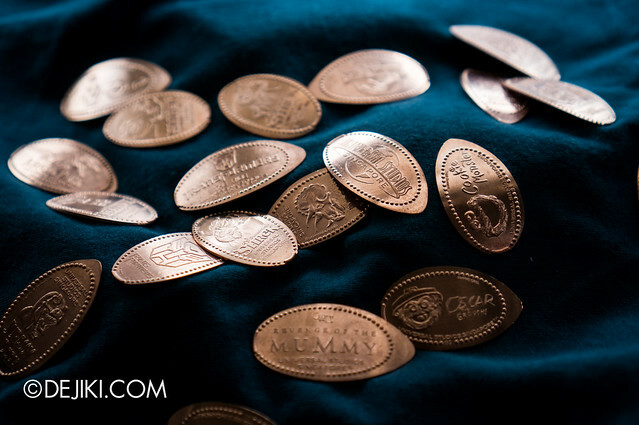 The Universal Studios Singapore pressed coins are souvenirs from the park. It is, in some ways, special because you have to press it yourself. 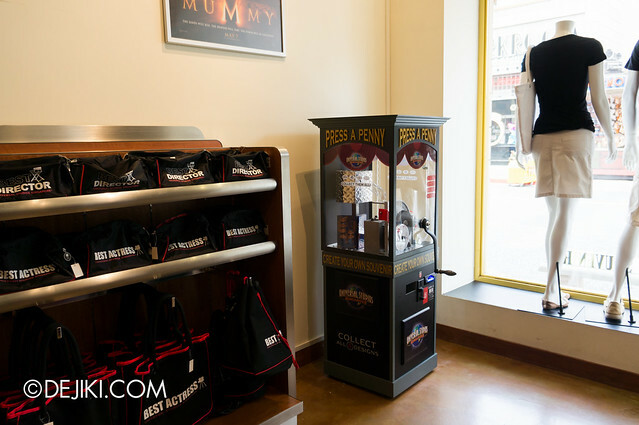 You can buy a Pressed Coin album from the park’s retail stores to store your coins. If you punch a hole, you can use the pressed coin as a keychain (with a key ring). I would recommend against wearing it as a pendant or bracelet because these USS coins oxidise very quickly. I want to collect them all! How much? 20 coin designs are available (as of April 2013) so that’ll be $40 for the entire collection from USS. The coin album will cost extra. Is there a money changer machine? I don’t have so many $2 notes. Approach the nearby store cashiers to change to smaller notes. My coins look dirty/rusty/green! What should I do? The pressed coins are made of unlacquered copper and will turn dark (and even green) eventually due to oxidisation. If you want them back looking shiny again, prepare a small mixture of salt and vinegar (in a saucer). Dip a coin into the solution and swish it around until it is clean. Wash the coin with soap. Rinse. Dry coins with a towel or paper napkin. As long as the coins are exposed to moisture (and air, basically), they will turn dark again. To make the coins last longer looking shiny and clean, you will need to use copper lacquer (spray or paint form) on the coins. Alternatively, store them in sealed ziploc bags to slow down oxidisation. Are there more coins? My coin album looks so… empty. According to a Park area manager, USS will eventually have a machine at every zone. There are two more machines at Marine Life Park offering 8 other designs. You can also fill your album with coins from other theme parks and attractions. However, please note that coins from Disney Parks are much larger and may not fit the slots in the USS coin album. To be honest, I don’t like to collect them, but I did press once just for fun! They are just nice to look at. Well, maybe not the ones from USS. When I’m at a Disney Park, it’s totally different though. I collected all three designs from Grizzly Peak – they look too good to pass up. Really?! I assumed that there are about the same as USS ones, so I did not even give them a try! I see but I love the turning the handle!!! Hii.. The quality of Disney coins in HK and Japan is the best, but not in USA which are using handle and real 1 cent penny. But in USA they do bigger coins and nickle coins that cannot change it color. I’m looking forward for collector in ASIA! There are actually six machines now, five inside and one outside (That’s a Wrap). 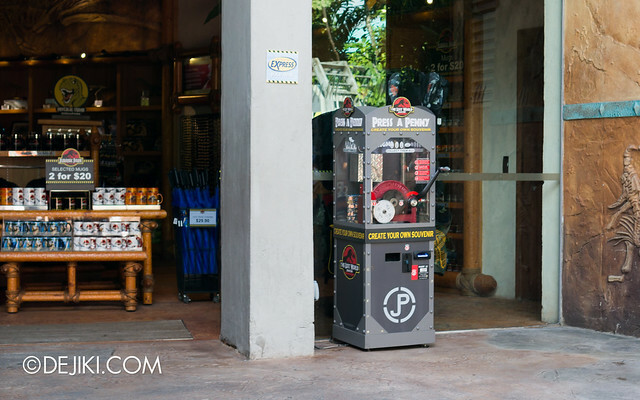 I am an avid collector who bought the ticket just to get the access to these penny machines. It was very disappointed that I couldn’t find the Hollywood machine since it was relocated to Malaysian food street. None of the store assistants didn’t know where it is either, they didn’t even know there was one in the store! I don’t recommend using vinegar to clean the pennies. Vinegar will make the penny dull and easier to get tarnished or oxidized back. I use toilet cleaner that contains hydrochloric acid and it works very well. I believe lime juice or orange juice should work as well. Sorry for the confusion, I thought That’s a Wrap and Malaysian food street are the different locations. So there are still five machines inside and one outside but I couldn’t find the machine at Hollywood, the store attendant also doesn’t know where it is. That machine must be relocated somewhere. Do you know where it is? 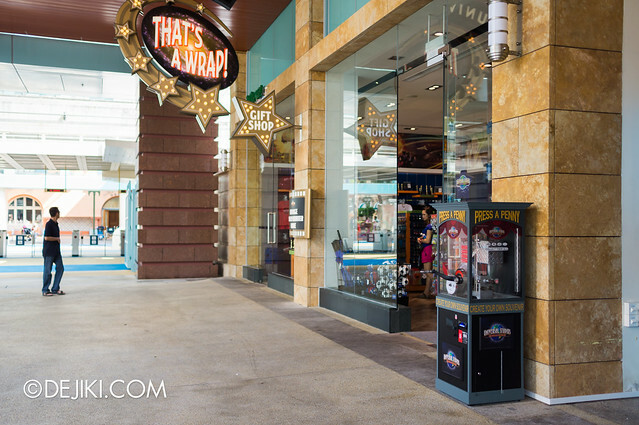 Hi Goi, The “Hollywood” series machines should be outside That’s A Wrap and at the entrance of Malaysian Food Street. 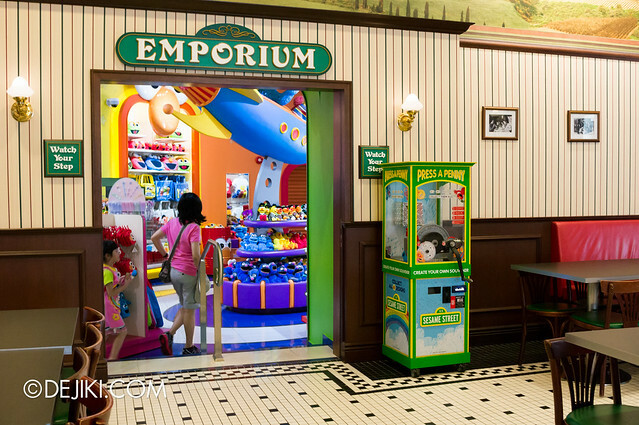 The one inside the park store has been moved (likely to be the one at Malaysian Food Street now). 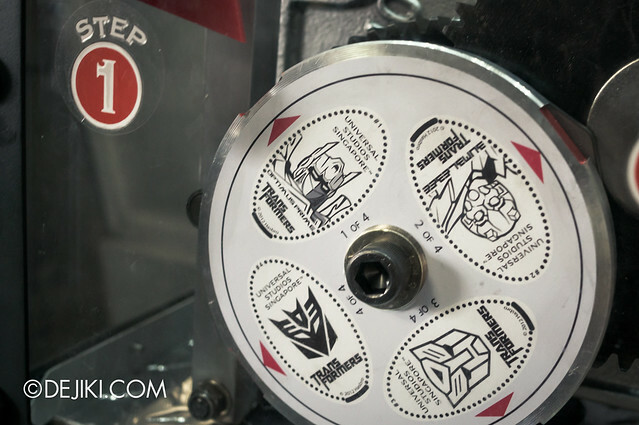 These machines have always offered the same 4 designs as stated in this guide, accurate as of April 2013. 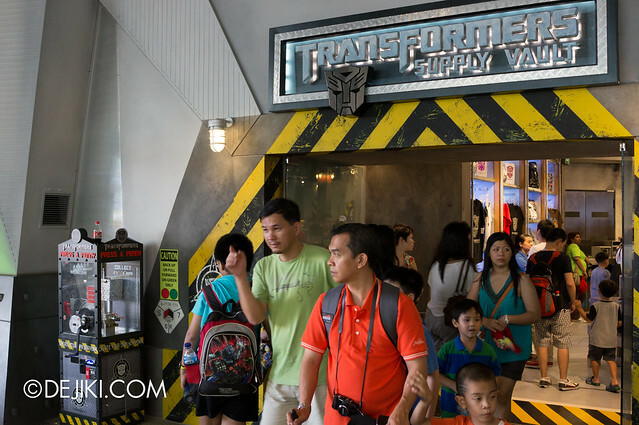 Periodically, the park moves the machines around, changes the designs or removes them for repair, but at least five different machines, for a total of 20+ designs, will be placed at the park as long as possible. Sorry to bother you again. I am now confused about the total number of machines. Is it five or six in total? If there are two machines outside, one in front of ‘That’s a Wrap’ and one at Malaysian food entrance (formerly at Hollywood), then it should be total of six, isn’t it? Thanks again. If you have any update on the new machines, could you please also update on Pennycollector.com? Thank you very much. It’s a treasure map for the collectors around the world. This guide is only correct as of April 2013 (when there were 20 unique designs available) and I have yet to update it with information about the new machine – which will be in next week, I hope! Rest assured that you have collected all 24 available designs at the park. And no, I didn’t use your photos. I always use my own when I submit to Pennycollector.com. I didn’t submit the first five, I submitted the ‘That’s a Wrap’ machine but still didn’t see it there. It’s the webmaster/admin who edit the photos, we have no control about editing. I guess they just want the outline of the coin so that’s why they cropped it that way. Suggest you put the light watermark on the coins instead. Cheers! Alright. I’ll drop a note to the webmaster. Thanks! You mean they change the designs as well? These are the designs at That’s A Wrap which are totally from Hollywood. I can send you the picture if you want. I don’t see why not, since the first series has been out for more than a year. Thanks for describing the new coins. I’ll update this entry with new info when I visit the park again. Thanks for the clarification! What a relief! I thought I missed one machine, phew! BTW, I went there on June 30.